This potato omelet is different from the potato frittata that I made previously. 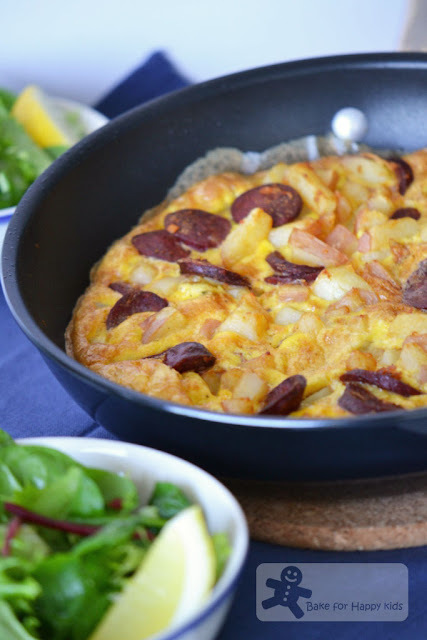 As described by Jamie Oliver, it is a cross between a Spanish tortilla and an Italian frittata. Spanish because of the chorizo and Italian because it is baked in the oven. 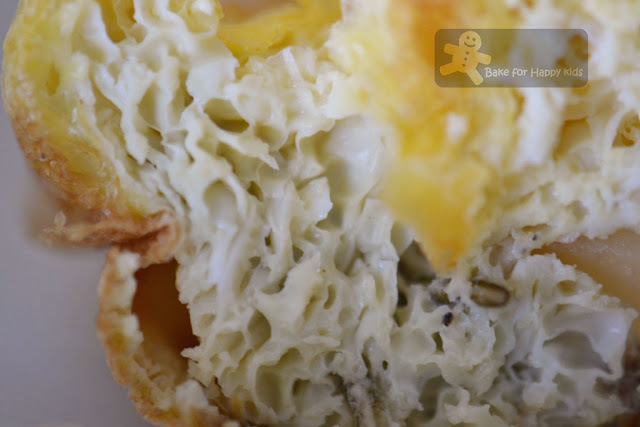 Interestingly, it puffs up like a souffle with spongy texture and this is something new that I learn from this recipe. This is how I assemble different components of this omelet. Watching the omelet to puff in the oven is quite exciting! Preheat your oven to high, or get your broiler nice and hot (mine is 220°C fan force with top grill). Put the potatoes into a saucepan of boiling salted water and simmer them until cooked, then drain in a colander and leave to steam dry. Beat the eggs with a fork in a large mixing bowl, season well with salt and pepper, and set aside. Heat a 7 or 8-inch nonstick, ovenproof frying pan (mine is 24cm in diameter). Add the chorizo slices and the potato chunks. 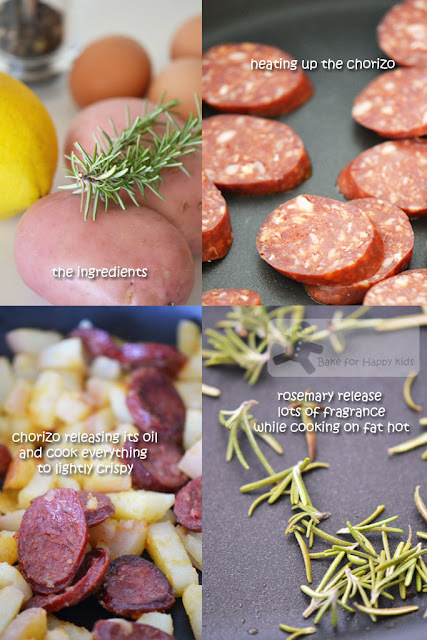 The chorizo will start to sizzle, releasing all its tasty oils and spices. After a couple of minutes, when everything's lightly golden and crisp, remove from the pan with a slotted spoon and set aside. Sprinkle the rosemary leaves into the hot fat. As soon as they hit the pan, they'll start to crisp up immediately pour the beaten eggs on top, adding the potatoes and chorizo and spreading everything out evenly. Place the whole pan in the preheated oven or under the broiler until the omelet is golden brown on top and just cooked through in the middle. This looks fantastic. I definitely will try this one. Hi Zoe! Thanks for visiting my blog... Your omelet looks perfect! I love cooking but eggs are something that I can never ever do right! Wow, this omelet looks amazing Zoe! It's so fluffy and I love how browned the outside is. Did you serve this up for dinner? I think it would be the perfect dinner accompanied by a salad. Great job as always Zoe. Aside from meatballs , that is one recipe that I really want to try ! That omelet looks really delectable , Zoe ! I also cooked omelet, fried eggs and sausage for my girls as breakfast nowadays. Thanks for sharing the recipe. Looks really puffy. And easy too. Thanks for sharing. This looks amazing! I love how it has little egg layers! Oh dear deliciousness! Hi Zoe, your potato omelet look delicious. I love the fragrant smell of the rosemary. The omelet looks so yummy! With chorizo, that sounds delicious! Perfect for lunch with some salad! My husband loves chorizo and eggs! Combining both together for him would be great! Thanks for sharing the recipe. Your omelete looks delicious! Yummy!!! This omelet would be perfect for breakfast, lunch, OR dinner! Wonderful recipe!!! So yummy! I love these kind of recipes! Your pics are so so so tempting! Oh Zoe,whst a hearty dish to have in winter,haha! that's really something new for me too seeing a puff up omelette. Didnt know making omelettes can also be that interesting! Well I am not a great cook but love to learn new recipes and try out. Hope you can visit me too and see whether you like to follow each other. One of my favourite Jamie recipes. Will hopefully join this month's blog hop soon! this is an interesting omelette and I like your amazing photographs. Very professional looking blog. With all those airpockets the inside is almost muffin like! This omelet is so different from those we have here. From your picture I can see the texture is so fluffy and spongy. Would like Very much to try this. 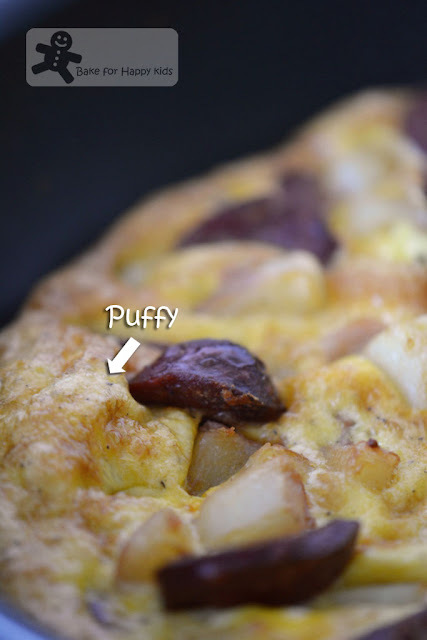 Love this yummy puffy omelet...wish I could have it for breakfast tomorrow morning! Wow! That's a very fluffy omelettes indeed! I would love to have this for my breakfast! Yum!